They have released this weeks freebies: June 22, 2015. They’re available until midnight on the 28th June. Grab this weeks freebies from across Creative Market. Pack includes 22 Sea/Food Icons in Vector EPS, PNG and PSD. Made in trendy flat icons style. Perfect for use in Fish Restaurants, Fish Houses or other Sea Business. This weeks free flat vector on creative market. Make a speech with speech bubbles! Hand-illustrated vector bubbles with lot of space for your interesting text. Every single bubble was drawn, scanned and edited in adobe illustrator. Available as Ai, layered PSD and transparent PNG. This weeks free speech bubble set on creative market. This is a collection of about 48 handmade stamp brushes for Photoshop. Each stamp is scanned in at hi-resolution to provide print quality images. This weeks free handmade stamp brushes on creative market. Baystyle is a charming font for all occasions. It is perfect blend of hand lettering and script italic characters. This weeks free Font on creative market. Start is a Premium Responsive One Page HTML Website Template. It’s an all-in-one solution powered by Bootstrap & LESS. This weeks free Bootstrap HTML template on creative market. Set flat square icons is a cute animals on color background Nature logos can be use for any project. This weeks free flat square icons on creative market. 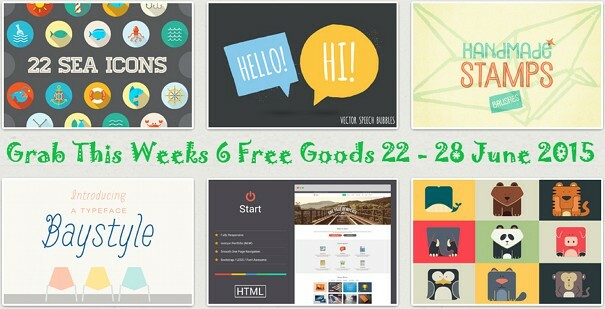 Item Reviewed: Amazing 6 Free Design Goods 4th Week June 2015 9 out of 10 based on 10 ratings. 9 user reviews.